Our family began celebrating Kwanzaa when our son and daughter were in kindergarten and grade school. My husband and I encouraged creative self-expression in our children and during their formative years we wanted to discourage the overemphasis on buying and receiving material things. So celebrating Kwanzaa (or First Fruits) was a perfect way to reinforce our family values, pass along some African-American history and have fun doing it right along with our children. Our family Kwanzaa celebration was very simple but it became a ritual that Katura and Stephan looked forward every day. First of all, they were able to learn new words in the Swahili language. What child wouldn't smile when trying to pronounce Kujichagulia? Then they challenged each other to remember the words and principles in the correct order. They both got a chance to light a series of candles and then blow them out (almost like a birthday party) and by the last couple of days they had made and exchanged handcrafted gifts (Zwadi). Finally, we had a big feast at home or celebrated a fiesta (Karumu) complete with music, dancing, family and friends on the last day of Kwanzaa. By the seventh day, we had had so much fun celebrating Kwanzaa that we didn't want to take the decorations down. So we didn't. Now the kinara remains in a central place in our dining room all year long. Although Kwanzaa was created as a cultural celebration for African Americans, the symbolism and rituals are valuable tools for anyone who wants to follow reasonable guidelines for being a productive member of their community. Talking out loud about the Nzguzo Saba helped our family realize that these were principles worth practicing all through the year. We realized that family time is very precious. That it's a good thing to have family meals together rather than grabbing grub on and eating it hurriedly on the way to some other activity. It's a good practice to help children learn how to listen and how to have a meaningful conversation at the dinner table. It's good for everyone to discover the joy of doing creative work with our hands. It feels good to share something of yourself that is unique whether that is reciting a poem, reading a passage from a book, telling a joke or singing a song. The principles of Kwanzaa reinforce the value of family and community. For very young children the principles can be explained in this way. - Ujima translates as collective work and responsibility and can be simplified to mean: We work together in community. - Ujamaa translates as cooperative economics and can be simplified to mean: we support each other economically. - Nia translates as purpose and can be simplified to mean: we work and live with purpose. - Kuumba translates as creativity and can be simplified as: we use our minds and our creativity. The Kwanzaa seeds that were sown during our first observance have grown into a harvest for our daily lives. A version of this article was originally published by ClubMom.com, 2006. 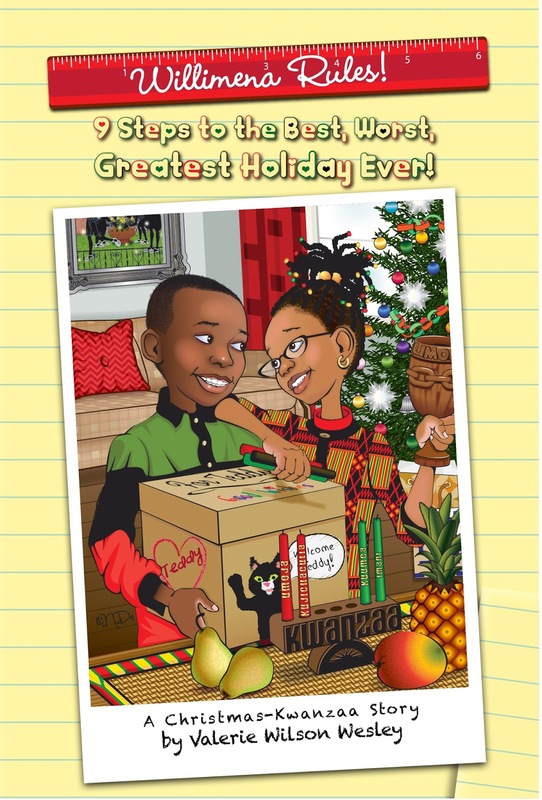 Check out these children’s books about Kwanzaa and visit The Official Kwanzaa website for more information. Christmas and Kwanzaa are right around the corner and Willimena is usually excited about her favorite time of the year. There are fun decorations, yummy food, the seven principles of Kwanzaa and, of course, gifts for both holidays. But this year, no one feels much like celebrating. Aunt Laura lost her job and Dad and Mom say that big changes are coming for the family--changes that mean Willie may not get that bike she wanted. Willie thinks she has it bad until she sees how these big changes are affecting her cousin Teddy. He's usually nice, friendly, and greets Willie with a grin. But lately, he's sad, mad, and downright rude.He doesn't seem to want to celebrate the holidays at all, and nothing Willie does to cheer him up is working. Christmas and Kwanzaa are supposed to be joyful, but this year is turning out to be the worst. Can Willie find a way to bring "happy" back to the holidays?